A Bexhill man has been jailed after being caught at the wheel while using a mobile phone when he was banned from driving according to a court document. 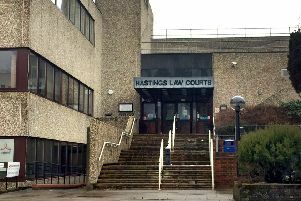 Ricky Wells, 31, of Dorset Road, Bexhill, appeared at Hastings Magistrates Court on February 20 and pleaded guilty to driving a Ford Focus on Bexhill Road, St Leonards, on October 19 while disqualified from driving. He also pleaded guilty to driving with no insurance and driving while using a hand-held mobile phone on the same date. He admitted being in breach of a suspended sentence made by an earlier court for an offence of having a Samurai sword in a public place, at Littlehampton, on September 3. He was sentenced to five months in prison and banned from driving for 14 months. Magistrates said the reason for the sentence was the seriousness of the offences and that he had ‘showed a flagrant disregard for court orders’.